Sometime later, Eva gives birth to a second child and while the pregnancy is not captured on the screen, the relationship of Eva to her new daughter seems to be far more “normal” than the one she’s always had with Kevin. Though Kevin’s relationship with his sister seems to fit the pattern of that of an older brother/big sister dynamic, there is always something that seems to be lurking, waiting to stick out its ugly head, whether it be in the form of an ominous glance of pure hatred, or by a carefully orchestrated zinger at his mother. Something must definitely be wrong with Kevin. The story presented to us by director Lynn Ramsey is about a mother looking back with a mixture of regret, shame and sadness at what was her married suburban life raising two children. All of her negative feelings seem to revolve around her relationship to son Kevin. As the film progresses, we begin to get a sense at what happened to her and her family and why she ended up living alone, victim of very hostile neighbors. Though the insight about the relationship between Eva and Kevin is incredibly interesting, complex and eerily chilling, Lynn Ramsay does not seem to trust the story enough to let it speak for itself, letting her style of filming get in the way of content. How many times do we need bright splashes of red to dominate the shot? How many references to blood do we need to understand the looming threat of great violence coming up? Apparently, Ms. Ramsay feels that she should insist on this with endless fields of tomatoes and the ocassional splashes of red paint on white. Ms. Ramsay also favored a non-linear approach to storytelling. Though it can be a powerful tool that infuses suspense and provides insightful backgrounds to our characters, in this film it seems to be overplayed, lacking cohesion and distracting us from the story itself. There are plenty of suggestions indicating the nature of the final twist and while some offer great insight, there are a few that just seem odd, even bordering on the comical (there is something about a bow and arrow that just seems like too much). Though the evolution of the relationship between Eva and Kevin is the film’s strongest asset, so are the details around them, like the innocent sister and the clueless father, both spectators to the chilling and troubling interaction of the protagonists. Teenage Kevin played by Ezra Miller is a disturbing character, even before we know what he’s capable of. His words may be few, but they all hold weight, and they always manage to unsettle Eva who is uncapable of translating her concerns into actions. Eva manages to convince herself that her son, one she loves despite the troubling indications, could be capable of doing evil. Is it all bad parenting? Or is Kevin just naturally odd and hurtful, maybe even evil? The motivations behind Kevin’s peculiar behavior is what we, the audience, truly want to discover. Crucially, director Lynn Ramsay does not try to answer these questions for us, limiting herself to presenting the evidence, letting us craft our own theories and thus, keeping our attention despite the stylistic distractions. A terribly disturbing film that kept my attention on-screen from start to finish. Swinton and Miller were both terrific and it’s a real wonder why they didn’t even get an Oscar nomination. Good review. We Need To Talk About Kevin sticks in my mind, and is in my top 10 of 2011. The approach to storytelling is very different to the book-which is I’ve heard is a series of letters. The film relies more on visuals to show how the mother is feeling. For me, the build-up was very well done. Luckily I didn’t read anything about story beforehand. Although I think the pay-off means its not a film I’d rewatch a lot. I think the evilness may put off it becoming a family favorite. 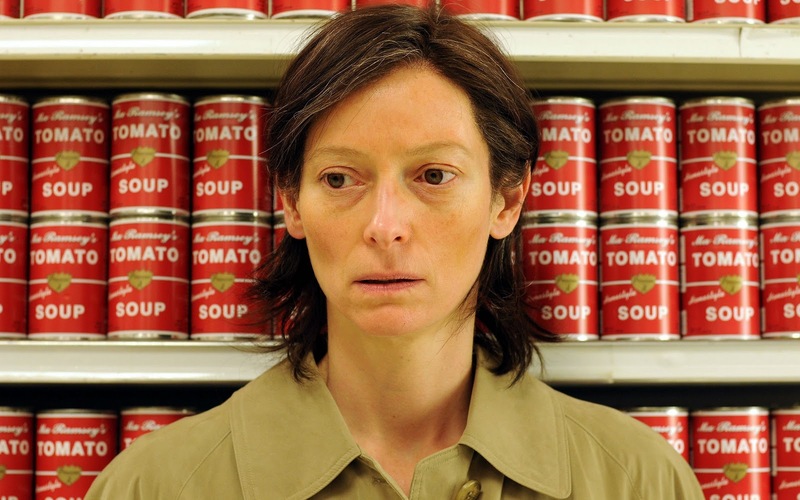 I don’t usually like Tilda Swinton, but thought she was a great choice here, so so the actor for Kevin. The title I think is important, they “need” to talk about Kevin, but do they? Great review. I haven’t seen it but the title is truly one of the best movie titles ever [now that’s an idea for a post], it has that sinister tone and kind of gives you an idea that Kevin has done something terrible before you even know what the film is all about. I was really impressed by Kevin. Very haunting experience and Tilda Swinton is phenomenal. I watched and reviewed this one recently — what a disturbing film. I thought this was a brilliant movie, and your review is terrific. I didn’t buy the premise that not becoming attached to ones child can cause him to be a sociopath. However, the film definitely left room to wonder. I also wondered about the validity of what we were seeing on screen, since it was being shown through Eva’s eyes. Is it even possible for a toddler to be so cold and rebellious toward a parent? Or are we literally seeing her skewed memories. This was definitely thought provoking!